On Newark Air Museum’s site in eastern Nottinghamshire; close to the border with Lincolnshire preparations are well in hand for the 1940s Weekend event, which takes place on Saturday 11th and Sunday 12th August. This two day event has been organised to commemorate various aspects of the 1940s at what is part of the former RAF Winthorpe airfield site. In the Dig For Victory Garden near the Anderson Shelter the produce is being readied for harvest and may be used to feed the volunteers who will be looking after the new World War II ROC (Royal Observer Corps) that will be completed in time for the event. All around the museum’s extensive site, which will be developing a distinctive 1940s feel, the final display positions for visiting displays / groups are being set out; both under cover and outside. These displays include: vintage vehicles (cars and military vehicles; local history groups; variety of themed wartime trade stalls; and will feature regular performances during the weekend by Fiona Harrison, “A Voice in a Million”. 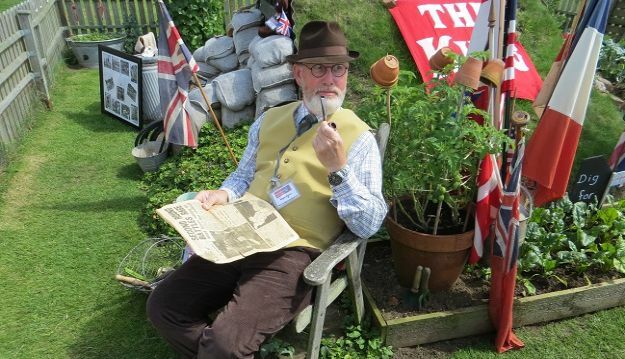 The museum wants to encourage as many visitors as possible to enter into the ‘1940s spirit’ and to attend in period costume. Such participants will be admitted for free if they register in advance and at a discounted admission rate if they just turn up on the day. On both event days the museum has been granted flypasts by aircraft from the Battle of Britain Memorial Flight, which is based just over the county border at RAF Coningsby.